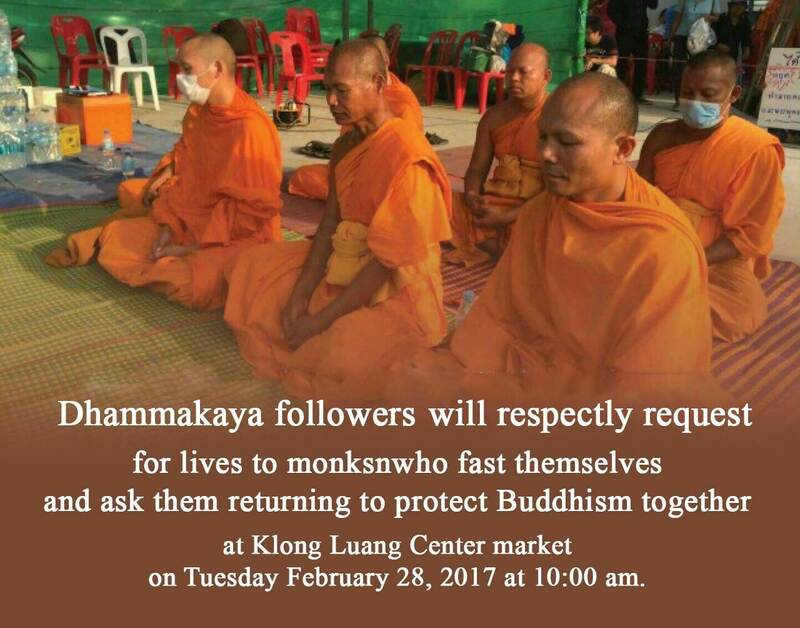 On February 28, 2017, around 10AM at the Khlong Luang central market, Wat Phra Dhammakaya’s followers organized a ceremony to plead the monks on starvation protest to change their mind and come back to protect Buddhism. 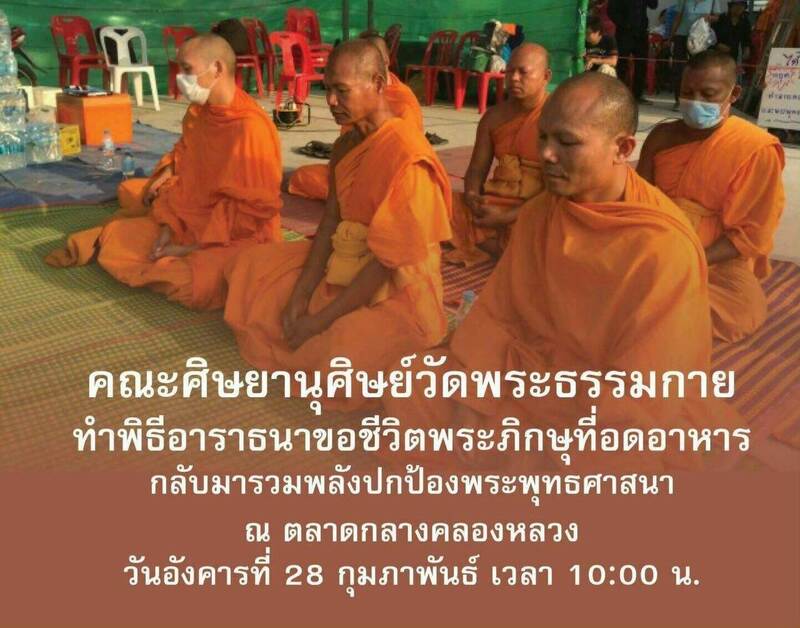 In the ceremony, a teaching monk of Wat Phra Dhammakaya made an announcement about the activity’s purposes. 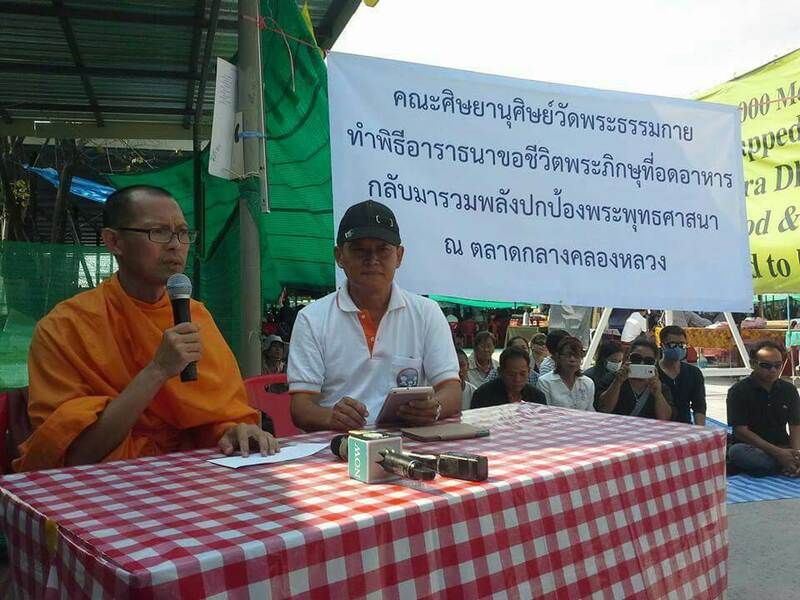 Also, a representative of Wat Phra Dhammakaya’s followers, who does not want to make a personal appearance, talked about her starvation protest behind the spot where the monks are starving themselves. This auntie said that she was on a starvation protest for 7 days to pressure her son who was a monk of Wat Phra Dhammakaya at that time to leave the monkhood. However, she finally realized that her action was useless, so she changed her mind and helped support her son and Buddhism instead. 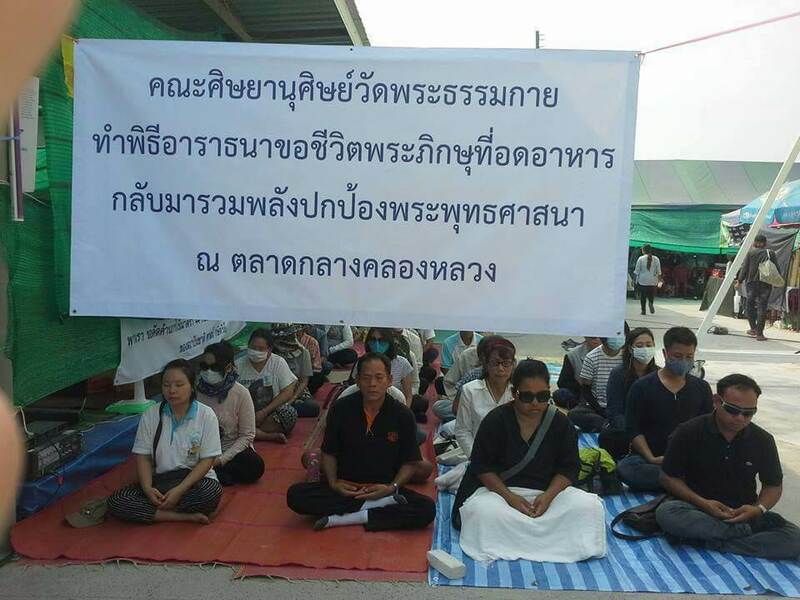 She is asking the 5 monks on starvation protest to stop their starvation because it does not help in revocation of article 44. Before another representative of the temple’s followers read the official statement to plead those starving monks to change their mind and helped others in Buddhism protection, the doctor team that examined their bodies indicated that some of them were weary and some coughed in blood. 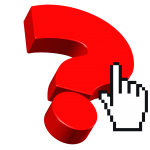 However, even though the followers pleaded them for it, the decision was on them. From the inquiry, they insisted to continue their starvation protest. วันที่ 28 กุมภาพันธ์ 60 เวลาประมาณ 10.00 น. 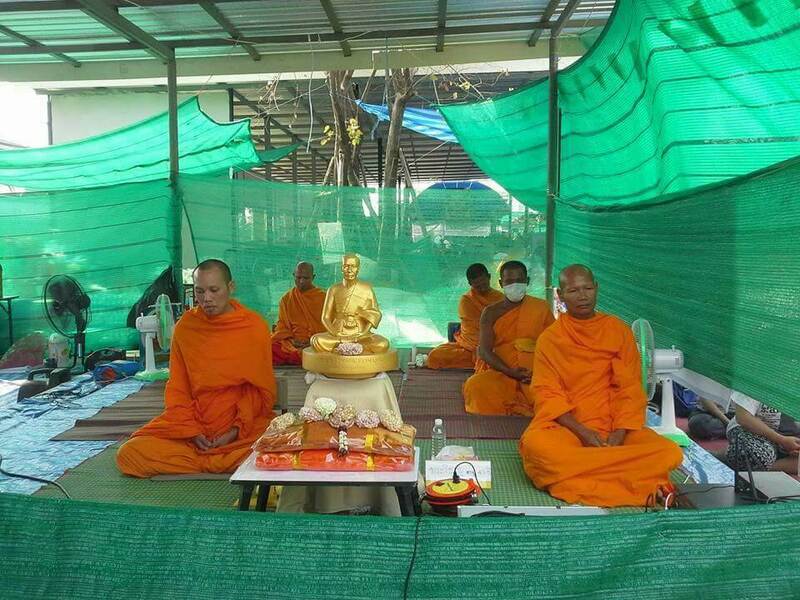 ที่ตลาดกลางคลองหลวง คณะศิษยานุศิษย์วัดพระธรรมกาย ทำพิธีอาราธนาขอชีวิตพระภิษุสงฆ์ที่อดอาหาร กลับมาปกป้องพระพุทธศาสนา โดยมีพระอาจารย์วัดพระธรรมกาย ออกมาแถลงวัตถุประสงค์ของการจัดกิจกรรม ทั้งนี้ได้มีตัวแทนคณะศิษยานุศิษย์ซึ่งไม่ประสงค์จะแสดงตัว มาเล่าประสบการณ์การอดอาหารอยู่ด้านหลังจุดที่พระอาจารย์ประท้วงอดอาหาร ซึ่งคุณป้าท่านนี้เล่าว่า ตนเองประท้วงอดอาหาร 7 วัน อยากให้พระลูกชายที่บวชอยู่วัดพระธรรมกายลาสิกขา แต่สุดท้ายคิดได้ การกระทำดังกล่าวไม่เกิดประโยชน์ จึงกลับมาอุปัฏฐากพระลูกชาย และมาบำรุงพระพุทธศาสนาจนถึงทุกวันนี้ พร้อมทั้งกราบอาราธนาให้คณะสงฆ์ทั้ง 5 รูป เลิกอดอาหาร เพราะไม่เกิดประโยชน์ในการขอยกเลิกมาตรา 44 !